Why did the visual arts find such a welcome place in the preaching, teaching, and devotional practices of the Franciscan and Dominican movements, and in the places designated for their missional works? The question is not new ; here I will underline how Franciscan and Dominican valuing of visual imagery follows the apologia for visual imagery regularly repeated for a thousand years, beginning with Pope Gregory the Great: images are properly valuable for instructing, for remembering, for inspiring. Bonaventure’s Tree of Life makes a nice pair with another influential 13th-century devotional treatise, De Modo Orandi (the modes of prayer) written by a Dominican friar about the bodily comportment of St. Dominic at prayer. Both treatises received high-profile visual representation. 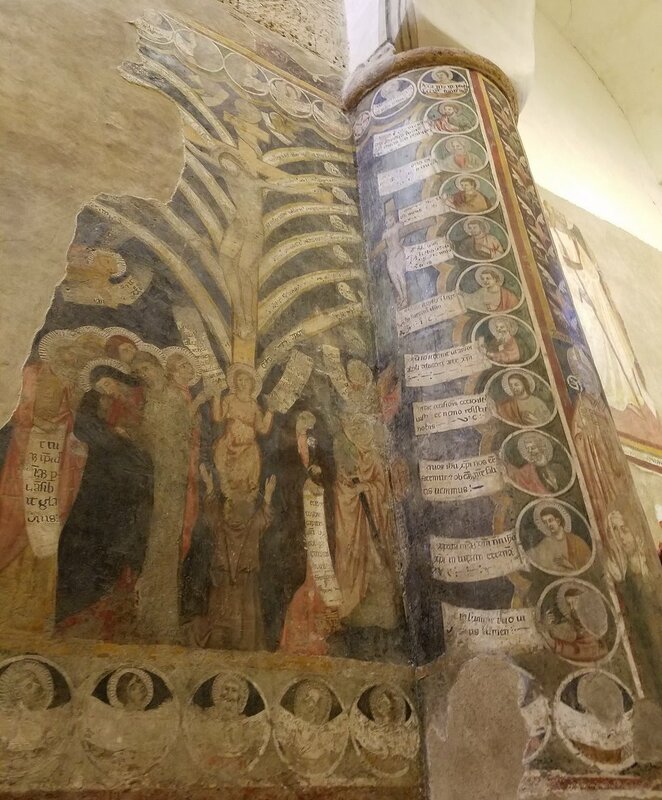 Florence boasts two: Taddeo Gaddi’s Tree of Life in the refectory of the Franciscan monastery of Santa Croce, and Fra Angelico’s series of the Modes of Prayer in the friars’ cells in the Dominican monastery of San Marco. While living in the traditional manner in small communities obedient to a shared rule of life, these new orders cultivated a socially-engaged outward focus towards serving the needs of those in the world around them. In contrast with the stability of place in Benedictine monasticism, their founders imagined and followed largely peripatetic missions – a direct response to Jesus’s sending out the disciples on preaching missions with no second cloak, begging for their food (hence the nomenclature of the two new “mendicant” or begging orders). The rapid and remarkable spread of the two orders introduced complexities, conflicts, and compromises. Nevertheless, the movements birthed by these two charismatic and scandal-free figures have regularly been credited with bringing spiritual renewal to church and society. Their missions were different but not in conflict; two sides of the same coin. Dante’s pair of characterizing features – Francis with the ardor of love, Dominic with the zeal of learning – stands as a motif for distinguishing the two in all discussions since, this one included. The Franciscans appreciated the power of the arts to stimulate the affective side (accendatur affectus) of loving God and our neighbors. The Dominicans more typically used the arts to give visual form to ideas and to cultivate intellectually rigorous forms (formetur cogitates) of meditation. Each valued the capacity of visual images to aid memory. St. Bonaventure’s Tree of Life (Lignum Vitae) presents brief devotions on the life of Christ, divided into the three “mysteries” of Christ’s Origin, Passion, and Glorification, each with an equal number of subsections and episodes. In fact, the parallels of organization and of grammar, syntax, and rhetorical form are intentional: “I have bound it together with a few ordered and parallel words to aid the memory,” writes Bonaventure in his introduction. But it is the cross of Christ that is the hinge of the whole. The prologue begins with the verse from Galatians: “With Christ I am nailed to the Cross.” A “disciple of Christ,” writes Bonaventure, “who desires to conform perfectly to the Savior of all men crucified for him, should, above all, strive with an earnest endeavor of soul to carry about continuously, both in his soul and in his flesh, the cross of Christ until he can truly feel in himself what the Apostle said above” (p. 119). 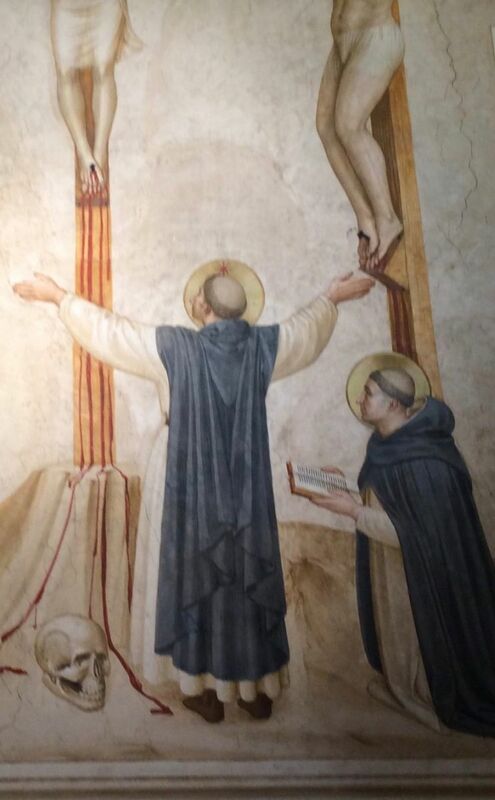 Certainly it was St. Francis’s own devotion to the cross – rewarded in his receiving of the stigmata two years before his death when he made a retreat to La Verna on the feast-day of the Exaltation of the Cross – that inspired the general Franciscan devotion to the Cross. Hence the Franciscan adoption of the narrative of salvation history found in the Legend of the Holy Cross, which traces the genealogy of the tree from which the cross was fashioned back to the tree in Eden. 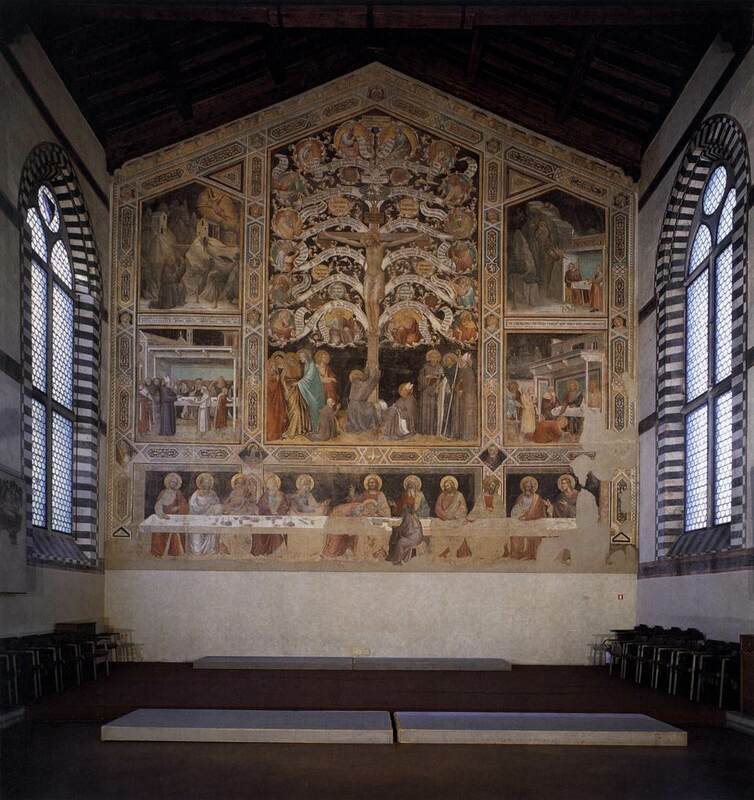 The two monumental fresco cycles of this story (by Agnolo Gaddi and Piero della Francesca) are both found in Franciscan monastery churches: Santa Croce in Florence and San Francesco in Arezzo. A few examples show the explicitly affective direction of a style intended to stimulate the emotions appropriate to the scene. “Oh, if you could feel in some way the quality and intensity of that fire sent from heaven …” (p. 127). “Now, then, my soul, embrace that divine manger; press your lips upon and kiss the boy’s feet. Then in your mind keep the shepherds’ watch, marvel at the assembling host of angels, join in the heavenly melody, singing with your voice and heart: ‘Glory to God in the highest’ …” (p. 129). “Rejoice, then, with that blessed old man [Simeon] and the aged Anna … Let love overcome your bashfulness; let affection dispel your fear …” (p. 131). “O human heart, you are harder than the hardness of rocks, if at the recollection of such great expiation you are not struck with terror, nor moved with compassion nor shattered with compunction nor softened with devoted love” (p. 154). The fresco not only represents the text but gives it to us, with the first phrase of each of the 48 “fruits” presented as scrolls contained by the fruit. Not unlike Bonaventure’s Tree of Life in genre, length, and purpose, On Dominic’s Manner of Prayer (De Modo Orandi) is a key devotional treatise in the Dominican tradition, written by an anonymous author sometime between 1260 and 1288, very probably for the community of Franciscan nuns in the Monastery of St. Agnes at Bologna. That is, De Modo Orandi (unlike Bonaventure’s Tree of Life) is not about the work of directly evoking those emotions in the reader while reading (as Bonaventure does) but is a teaching manual for devotion, in which the reader imitates the teacher. The implication is: do what Dominic does and eventually you will feel what Dominic feels. Once your body’s comportment is adequate to the matter, your affective response, having been trained by the master, will match the body’s response. The mind orders the emotions, but the proper comportment of the body has an important role in activating the appropriate emotion. Such an instructional booklet could be written without pictures; the descriptions are precise. And yet, just as with the Franciscan Tree of Life, the highly-visualized description of Dominic at prayer invited visual illustration, which it received first in manuscripts of the treatise, and then, with the assumption of familiarity with the text, in independent painted images. In a certain sense, the cell frescoes operate in the same manner as the treatise. Just as the treatise focuses the reader’s attention not on his own interior state at the moment but rather on the comportment and affective expression of St. Dominic, so the occupant of the cell imitates the comportment of the model in the cell, thereby training his own body to become the vessel of the appropriate emotion. The spiritual discipline does not assume a prior affective maturity on the part of the young friar, but rather is intended to train the novice so that the appropriate affective state kicks into gear when beholding a scene from the scriptural text and sacred history. What I have set before us, all too briefly, are Franciscan and Dominican Arts of Devotion that (a) could and did stand alone as written texts readable without illustration, but which (b) invite reading as memorable visualization, and (c) were in fact given visual form in painting as an aid to memory that instructs the intellect and stimulates the affections – these being held as the chief purposes of the arts. Are Franciscan and Dominican arts of devotion relevant for us? I think so. We need art that instructs, reminds, and inspires communities tuned to service. We need spiritual exercises, visio divina, strengthening of memory. I might observe that the affective orientation of Francis more naturally appeals to the “feeling” orientation of contemporary culture and churchly practice, while providing a disciplining of emotion so that it is commensurate with the actions of Christ. Yet I also might say that the rigors of bodily and mental comportment of the Dominican visio divina may be the more needful in an age of slouching, of weak attention span, of poor memory, and of weakness of will. As Dante emphasized, we need both. John Skillen taught courses in medieval and Renaissance literature at Gordon College (Massachusetts) before serving as the inaugural director of the College's arts-oriented semester program in Orvieto, Italy. He now directs the Studio for Art, Faith & History, sponsoring conferences, exhibitions, and projects in theatre and the visual arts that address the relevance of pre-modern European culture for our postmodern context. The Franciscan monastery Santa Croce in Florence is chock-full of masterworks, as are the two main Dominican monasteries, Santa Maria Novella and San Marco. The Basilica in Assisi, burial place of St. Francis, is of course filled wall-to-wall on two levels with artworks by significant painters in the 14th century. A favorite of mine is Benozzo Gozzoli’s scenes from the life of Francis (including a touching depiction of the supposed embrace of Francis and Dominic) in the apse of the church of the Franciscan monastery in Montefalco. Orvieto itself contains two works of art with direct Franciscan and Dominican influence. The parish church of San Giovenale contains an important fresco (although significantly deteriorated) of the Tree of Life directly illustrative of the treatise to be discussed by St. Bonaventure. And the monumental fresco cycle in the San Brizio Chapel of the cathedral depicting of the End Times and the Last Judgment, begin around 1450 by Fra Angelico and completed fifty years later by Luca Signorelli, has an obvious presence of Dominican friars (since the Dominicans played a central role in refuting the gnostic heresies of the Cathars, who had a presence in Orvieto); indeed, Signorelli’s contract itself requires him to work closely with the “masters of the sacred page,” almost certainly referring to the theologian-friars at the Dominican monastery in town – where Thomas Aquinas himself taught and wrote for several years in the 1260s. And Bonaventure was born nearby in Cività da Bagnoregio. One place to start is with the book Sanctity pictured: the art of the Dominican and Franciscan orders in Renaissance Italy, edited by Trinita Kennedy, the catalog of the exhibition by that name at the Frist Center for the Visual Arts, 2014. Rab Hatfield’s essay, “The Tree of Life and the Holy Cross: Franciscan Spirituality in the Trecento and Quattrocent” in the volume Monasticism and the Arts, edited by Timothy Verdon (Syracuse, 1984), pp. 133-60, is directly relevant. See my discussion in Putting Art (back) in its Place (Hendrickson, 2016), pp. 9-11, citing Evelyn Welch, Art in Renaissance Italy (Oxford, 1997); Michael Baxandall, Painting and Experience in Fifteenth Century Italy, 2nd ed. (Oxford, 1988), p. 41; and Peter Humfrey, The Altarpiece in Renaissance Venice (Yale, 1993). Both treatises are found in the Classics of Western Spirituality volumes (published by Paulist Press) on Early Dominicans and Bonaventure. Rab Hatfield (essay cited above) details the Franciscan attraction to the long typological tradition of conflating the Tree of Life in the Garden, whose fruit becomes newly available on the Tree of the Cross, and fulfilled in the Tree of Life “which bare twelve manner of fruits, and yielded her fruit every month” described in Revelation (chap. 22). The Dominican Simon Tugwell underlines this aspect in his Introduction to the Classics of Western Spirituality volume on Early Dominicans: Selected Writings (Paulist Press, 1982). His description of Humbert of Romans’ Treatise on the Formation of Preachers applies to Dominic himself: “We find none of the dramatic fervor or emotional intensity that is characteristic of the Cistercian writers [or of the Franciscan]. Though he, like them, no doubt wishes to encourage the zeal and enthusiasm of his brethren, he sets about it, not by composing fervor-inos [sic], but by presenting his exposition as clearly as he can; he appeals to the emotions strictly by way of the mind” (p. 3). 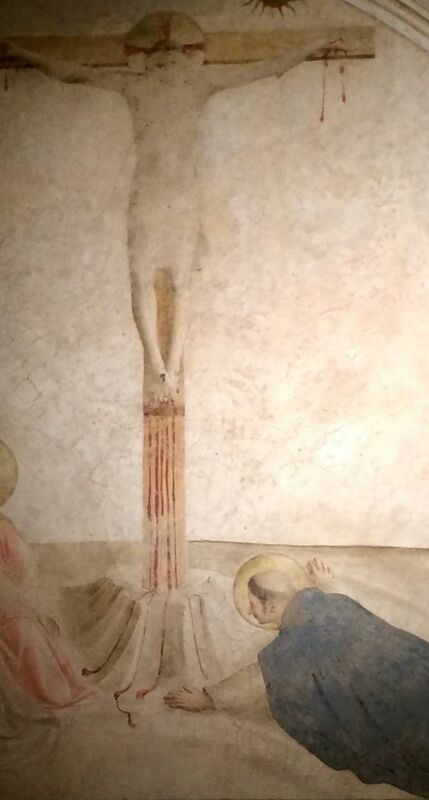 William Hood is the scholar who has rediscovered what would have been obvious to the generation of friars for whom Fra Angelico did his work; that is, the correlation between the postures of devotion painting in the frescoes and the postures systematized in De Modo Orandi. See Hood’s comprehensive study of Fra Angelico in San Marco (Yale University, 1993), especially pp. 200-207.